There are so many choices when it comes to picking out your Chromotherapy bathroom system, whether it be a shower system or an air massage tub with color Chromotherapy treatment. What Chromotherapy System is Right for you? Which Colors will Best Benefit you in the Bathroom? Lighting in your bathroom should be something that is worked out from the very beginning since the correct lighting systems usually need to be designed ahead of time so that they can be waterproofed, installed and serviced. Unless of course, you make the entire process easier on yourself and your designer/contractor and invest in a Chromotherapy shower system or air massage tub, which will give your bathroom, bathing and showering experience, even more, benefits. It is also possible to have the Chromotherapy shower and bathtub as well as the correct bathroom lighting, but you will need to properly coordinate so as not to over-do the look in your bathroom. There are so many choices when it comes to picking out your Chromotherapy bathroom system, whether it be a shower system or an air massage tub with color Chromotherapy treatment. 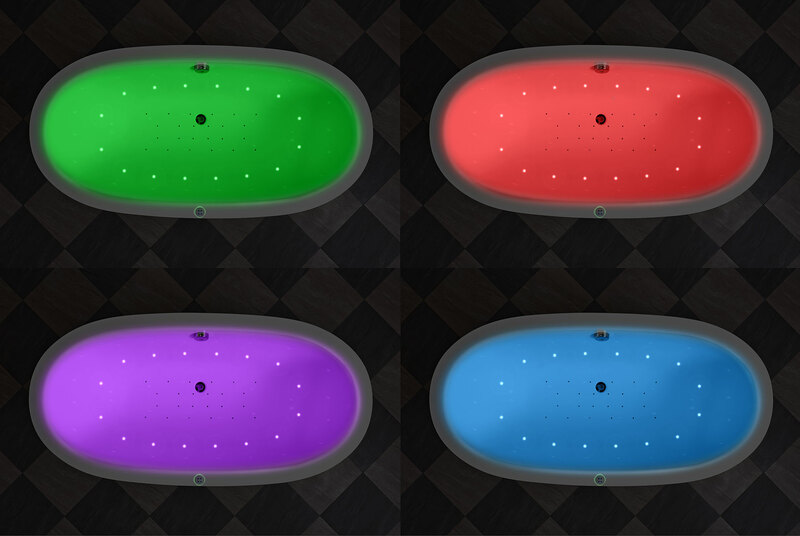 All the bathtubs from Aquatica that come installed with air massage also come installed with multi-colored Chromotherapy light options, which is great, because you can set them to have whichever light you prefer when you prefer. 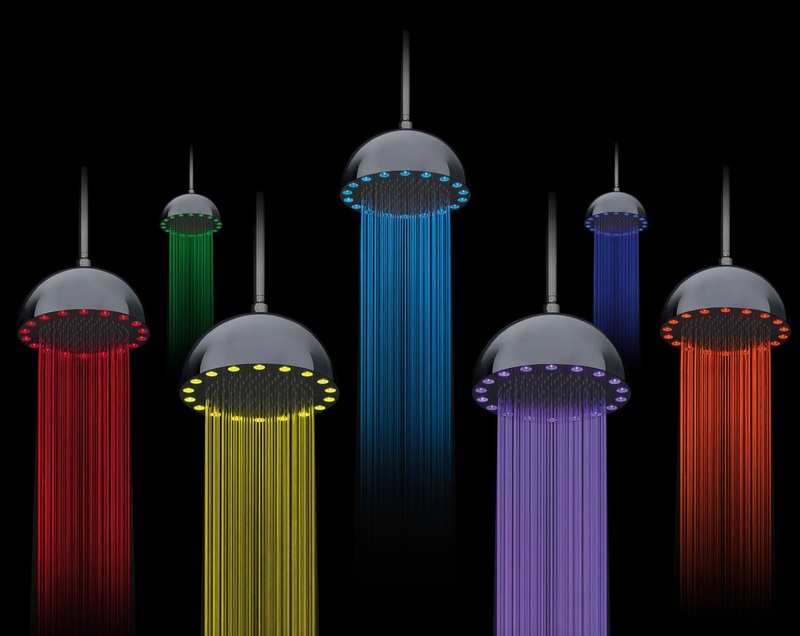 The same goes for Chromotherapy showers, you can choose to have the multi-colored light system, or just the blue lights or of course just the soft white lights. It really just depends on what colors will help you soothe and ease into your daily routine, and help you relax out of your stressful days and into relax mode for a good night’s sleep. Blue lights have quite a number of documented health benefits, it can aid in reducing blood pressure and calming one's breathing, and it also makes relaxing a lot easier. Blue light has proven to be an intriguing anti-inflammatory which also improves one's circulation, these are all pretty great things which will come in handy as you age. Red lights are perfect for energizing and stimulating the senses, mostly because the effects of red light in your shower or bathtub can increase your pulse rate. This is a great feature to have in a bathroom if you’re an athlete and often need to get charged up for a race or marathon. Red lights will also help get you in the mood for a little romance and warm loving. Green lights have been found to have quite a number of pleasing effects on people who suffer from irritability and insomnia. You can also benefit greatly from the color green in your bathroom if you’ve recently suffered a nervous breakdown, or if you suffer from a great deal of stress. Yellow lights will create an effectively happy environment in your bathroom and no doubt help warm your spirits up for the start of the day, or even at the end of a rough day. The color yellow can also help with digestion problems. White lights are soothing, calming and will help create mental clarity, and clearing of the mind, and it will also help soothe your muscles after a long day.